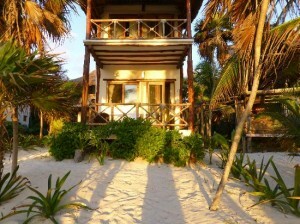 Beach Cabañas in Tulum, Mexico - Try a cabaña instead of a hotel! 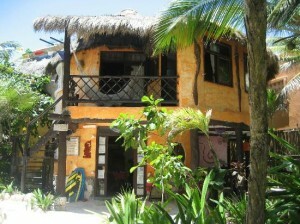 Tulum is famous for its ruins but is also known for its beach cabañas. A cabin, hut, or shelter, esp. one at a beach or swimming pool. We’ll admit, the official definition is a little scary. 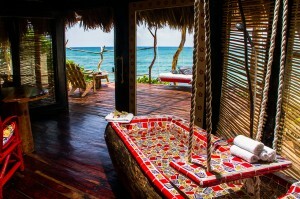 In Tulum, the cabanas are cabin-like shelters varying in degrees of comfort and amenities with either ocean or garden views. No TV’s, some with no electricity, but all with nature, sea breezes and white powder beaches. Keep in mind that you with nature comes insects and other creatures. If you can’t handle mosquitoes, or the other native animals, this may not be your thing. Cabañas are often more expensive than one might think, but having your own hut next to a talc-like beach has to have a price, right? Really want to get away from it all? These 10 cabañas with lush garden views will bring you back to when life was simple. Back to basics. Top that off with a great beach club and an on site restaurants offering fresh sea food and wood oven pizzas all beach side. This place will leave you saying OM. Just on the cusp of the Sian Ka’an biosphere, on a beach that will leave you in awe, you will find the hidden gem that is Rosa del Viento. 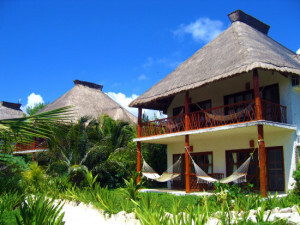 Perfect for a laid-back getaway, these cabins offer garden or ocean views with palapa type roofs. On site, there is a restaurant and bar with fresh food and drinks and friendly accommodating staff. Want a luxury cabaña experience? These 2 story wooden roof cabins all have private bathrooms with tub and shower, air-conditioning, sitting areas and a terrace or balcony with chairs and a hammock. Choose either ocean view or garden view. Their beachfront restaurant also offers room service in addition to the breakfast, lunch and dinner options. Additional services include yoga, massage, Mayan Oracle (Astrology reading), wedding planning, and themed parties. Eight thatched, colorful bungalows next to the Sian Ka’an Biosphere Reserve are powered by wind and solar energy. They have traditional decor and are surrounded by tropical gardens. The restaurant on site serves fresh delicious food and has waiter service on the beach! 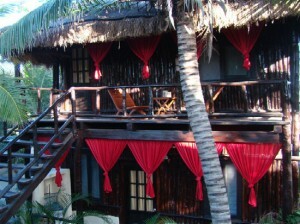 The hotel organizes lessons of sacred dance, meditation and full moon Mayan ceremony. It also has a Temazcal sauna, a range of massages and yoga available. These thatched roof cabañas are perched on a rocky bluff overlooking the sea. The perfect choice for a honeymoon, special occasion and to reconnect with nature. Listen to the sound of the waves on your private terrace. Candles are provided as there is no electricity in the cabins. The Maya Spa is on site for your holistic treatments and you can also indulge in a few yoga sessions or a Temazcal. If these options don’t suit your fancy, check out a full list of hotels in Tulum.